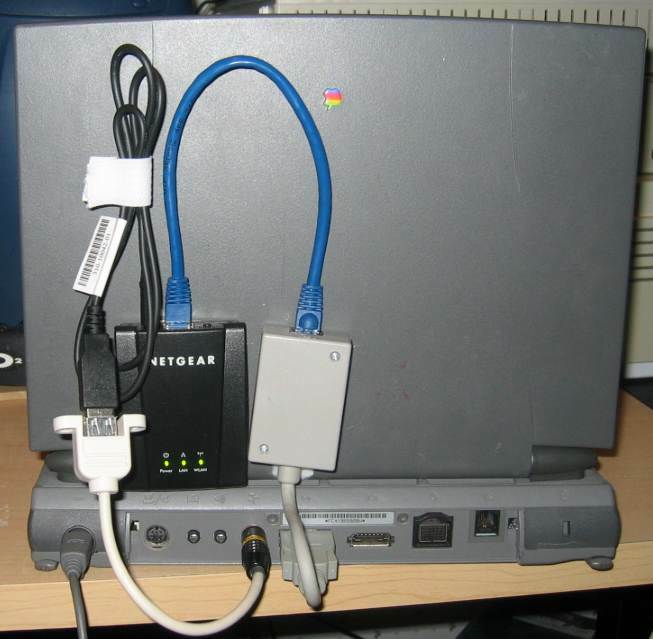 I currently use a Netgear WNCE2001 ethernet to wifi bridge with a PowerBook 540c. The 540c has builtin ethernet in the form of AAUI, but doesn't have any sort of wireless capability. Optional PCMCIA card cages were made, but are rare, expensive, and even if you get one, you're stuck with 802.11b and WEP. Not terribly useful on modern wifi. The WNCE2001 was chosen because it can be powered via 5V USB. I have created an adapter from the 540c's ADB port, which supplies 5V, to USB in order to provide power. I've also written a small System7 utility to configure the WNCE2001 natively. The configuration utility, when launched, will show some basic information about the connected device, and will show a list of networks it found on launch. You can manually rescan for networks by pressing the "Scan Networks" button. If you double click on a network, it will bring up the "Join Network" dialog, and will remember the settings for the network, autopopulating the network name, and behind the scenes it will remember the network security type (WPA/TKIP, WPA2/AES, etc). Enter the password (if it is not open), and click Join. It'll then instruct the WNCE2001 to join the network. 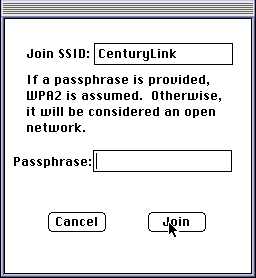 To join a closed (hidden) network, select "Join Network" from the File menu, and it will bring up the "Join Network" dialog, allowing you to enter the SSID of the closed network, as well as a password. If a password is supplied in this case, it assumes WPA2. When using DHCP from OpenTransport 1.x, and you switch networks (as in, it had successfully associated with and obtained an IP from a network, then successfully change to associate with a different network), OT won't pick up the new IP without manual intervention. The problem stems from limitations of OT and the behavior of the WNCE2001. 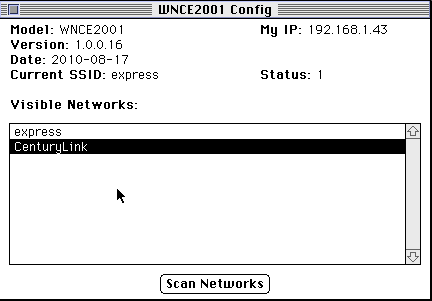 When switching networks, the WNCE2001 will disconnect the wired ethernet interface for a short period of time, then reconnect it. Most modern systems will detect the link state change and will issue a new DHCP request. However, OT 1.x doesn't do this. It just keeps the same IP through the link state change.